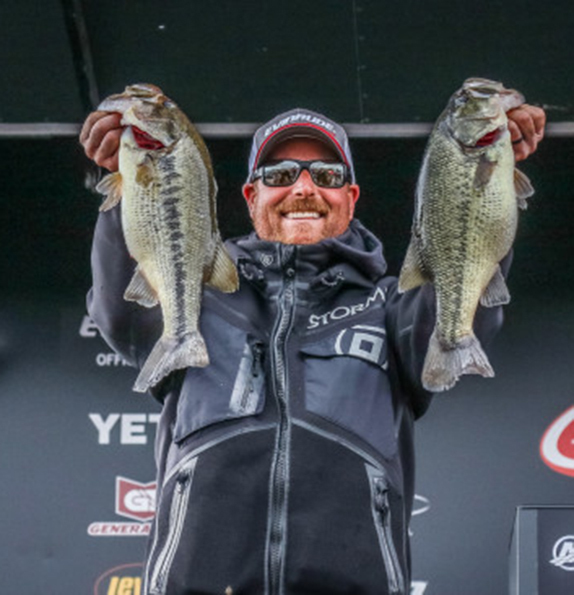 Bryan Thrift hasn't caught less than 16-02 this week and thinks he'll need 20 pounds Sunday to secure the win. It appears as if Bryan Thrift’s slump is over. It lasted one tournament. After a 130th-place finish at Lake Seminole earlier this month, Thrift seems convinced his chances to win a third career FLW Tour Angler of the Year title are toast. That remains to be seen. Fresh off a runner-up showing at the Lake Chickamauga Southeastern FLW Series last week, he arrived at Grand Lake with the mindset to escape northeastern Oklahoma with a decent amount of points to stay in the hunt for a 13th straight Forrest Wood Cup berth. He may wind up leaving with a lot more. 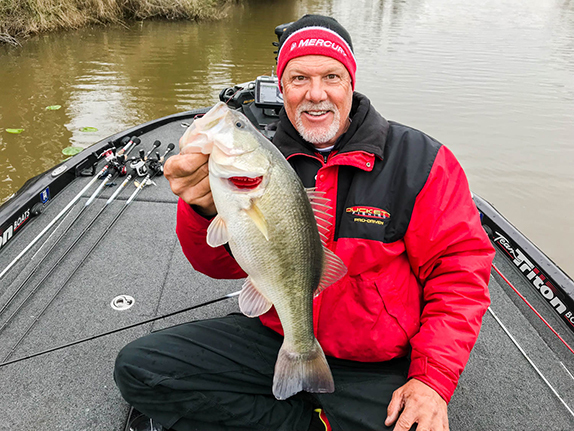 Thrift, the only angler to catch 16-plus pounds on each of the first two days, blistered 19-03 today and took over the lead with 52-01, moving up four places from yesterday. It was an impressive haul considering just 10 of the 30 competitors recorded limits today and only two others cracked the 15-pound mark. Jeremy Lawyer caught 17-09 today to jump from 11th to second with 48-14, giving himself a real shot at winning his first FLW Tour event. Billy McCaghren also positioned himself for a run at the victory with a 14-10 limit that pushed him into third with 46-12, leaving a deficit of 5-05 to Thrift. South Africa native and Tour rookie Michael Matthee moved up from 13th to fourth behind a 15-15 stringer today. Bradford Beavers caught 9-07 (four fish) and sits in fifth with 44-06, notching his second straight top-10 cut. Brian Latimer (6th, 43-04) and Sheldon Collings (10th, 39-09) also are making repeat appearances in the top 10 with Latimer looking for a second straight victory. Collings, the lone Oklahoma pro left in the competition, said on stage this afternoon he fell out of his boat prior to his run back to the boat ramp. Day-2 leader Bailey Boutries caught just one fish today for 4-04 and finished 11th, missing the cut by one ounce. Day-1 leader Kyle Weisenburger (20th) and AOY points leader Terry Bolton (27th) also slipped out of the top 10. Competition was delayed 45 minutes this morning by weather as wind and rain pelted the Grove, Okla., area. Once action got under way, it was a slow go for just about everybody. The wind is due to let up tomorrow and the sun will make a lengthy appearance, a combination that competitors haven’t seen yet. It might slow down the reaction-bait bite and force some to make changes. Thrift wasn’t able to define the source of his consistency this week. 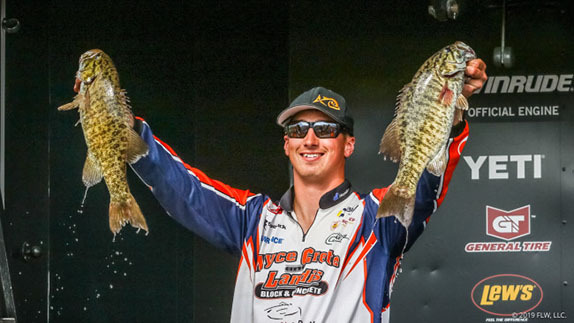 He said he hasn’t gotten enough bites to truly feel like he’s dialed in, but he’s clearly around the right quality of fish to win. He landed seven keepers for the second straight day and recycled some water that has been productive. After catching all of his fish on Thursday and Friday on a vibrating jig, he relied on a crankbait and jig today. His kicker fish today weighed close to 5 pounds. Thrift, who assured himself of his 13th top-10 finish, including Forrest Wood Cups, since the start of the 2016 season, will be chasing his seventh career Tour victory and second win in the last calendar year. Jeremy Lawyer put together a late-day surge to move into 2nd place entering the final day. Like anyone else, Lawyer would much prefer to have a 3-plus pound lead on Thrift than be trailing him by that amount, but he’s more than happy with how his week has played out. Under the tough conditions, he’s been able to trigger bites from areas that have produced for him in the past. He’s caught every fish so far winding a reaction bait. The action today didn’t pick up until the afternoon, though. Without a fish until 1:30, Lawyer loaded the boat with 17 1/2 pounds in the matter of 45 minutes. He’s interested to see how things change with less wind and a lot more sunshine on Sunday. McCaghren is on one of the best runs of his career right now – this event will give him four straight top-30 finishes – and he wouldn’t mind capping it off in style tomorrow with a win. With time winding down today, he had four keepers in the boat – “one 3-pounder and three barely keepers,” he said – when he pulled into a place he’d fished in the past but hadn’t caught much of anything there. In fact, it’s a spot where he lost a good fish on Friday. 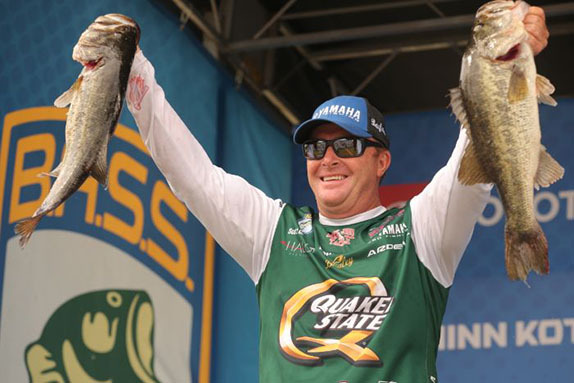 “I go back to fish for the fish I lost and it’s a had a long idle in and the waves were pretty big, and I didn’t think I’d get in there, fish it and get out and make it back in time for weigh-in,” he said. Somehow he did and he hooked into a 6-10 kicker that capped off a strong day and put him in the hunt. When he hooked it, he was just hoping it was a keeper. When it swam up close to the boat, he knew it was more than just a keeper. With his net already stowed for the ride back to the ramp, he played it out and landed it with five minutes left before heading in. 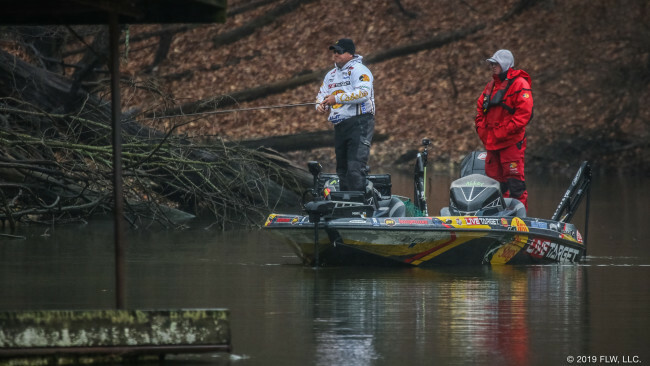 While Collings will face a 12 1/2-pound deficit on the final day, he’s just happy he made it back to the ramp this afternoon. After catching 14-13 by “pulling up on the right banks at the right time,” he slipped off the front of his boat and into Grand’s 48-degree waters while relieving himself. He was standing on the bow of his boat and after noticing a car driving by, he turned the to face the other direction and while doing so slipped into the lake. Wearing multiple layers of clothing along with rain suit bibs and heavy boots, he struggled to get back in his boat. With the help of his marshal, he finally did, but his fishing day was over. It took an hour and 20 minutes to get back to Wolf Creek Park, where the tournament is based, and he checked in more than an hour early. His parents met him at the ramp with dry clothes and a towel. “Between the delay this morning and that, I lost close to 3 1/2 hours of my day today,” he said. He knows he has nothing to lose tomorrow and is anxious to see how the lake reacts to the change in conditions.